Wholesale changes could be on the cards at Bridlington Town after they slumped to a dismal defeat against Athersley Recreation. Boss Curtis Woodhouse has threatened to show the door to a number of his first-team squad unless performances get better immediately. 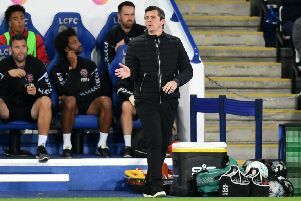 One player has already been told he will not feature for the club again and the manager says he spoke to four or five others on Sunday to demand improvements on and off the pitch. He told the Free Press: “I am looking for improvements in performance and attitude. Saturday’s 1-0 defeat meant ninth-placed Athersley had completed the double over Town within the space of three weeks. Woodhouse said he is hopeful that two new players will be in place for next Saturday as he looks to shake up his squad. One will be a player-coach and he is also looking to bring in a left-winger. Will Waudby, who started at left-back against Rec but was substituted at half-time, has been told he no longer features in the manager’s plans and is leaving the club. “We have been poor since Christmas, really,” admitted Woodhouse. “Results have papered over some of the cracks but Saturday was the final straw. He said he hoped that bringing a new coach into the set-up would mean a ‘fresh voice and fresh ideas’ in the changing room. “We are not going to win the league now, but we are still alive in two cups. “However, I am already planning for next season, how to put together a team that will win the league. Saturday’s game was thoroughly disappointing as the number of chances Town created could be counted on one hand. Sam Bebbington got the only goal of the game just before the half-hour mark and they comfortably held on for the three points. New signing Ryan Woodhead made his debut at right back with Woodhouse making three changes. Woodhead, Alex Knaggs and Jake Day came in for Tim Taylor, Nicky McNamara and Jordan Harrison, who played in the 2-0 win over Dunnington in the East Riding Senior Cup. Things on the pitch never really got going, with Andy Norfolk being booked for a nasty challenge on Dane Hodgson midway through the first half. Athersley were keen to see a red card but referee Elliott Heward felt a yellow was enough punishment, despite the visitors’ vocal protests. Shortly afterwards, Athersley broke the deadlock when Town keeper James Hitchcock misjudged a left-wing cross and after a scramble, Bebbington slotted home. Following a less than impressive first half, Woodhouse brought off Day and Waudby and brought on Kurtis Bedford and Louis Kirk. The latter added some much needed firepower in the midfield, with the absence of McNamara being well and truly felt. Things didn’t get much better for the Seasiders in the second half, with chances for either side being few and far between. Athersley defended resiliently and were streetwise enough to use every trick available to them to disrupt Town’s rhythm and slow the game down as much as possible. Woodhouse said: “We lacked any sort of desire, work rate and any sort of impetus from the lads to put their bodies on the line for each other and for the shirt.